We study the surface deformation associated with the 22 December 1999 earthquake, a moderate sized but damaging event at Ain Temouchent (northwestern Algeria) using Interferometric Satellite Aperture Radar images (InSAR). The mainshock focal mechanism solution indicates reverse faulting with a NE–SW trending rupture comparable to other major seismic events of this section of the Africa–Eurasia plate boundary. 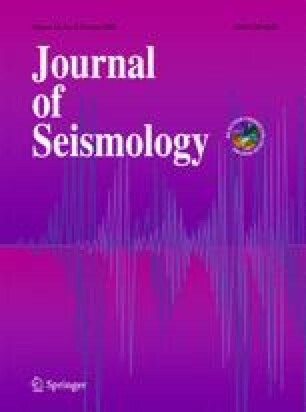 Previously, the earthquake fault parameters were, however, poorly known because no aftershocks were precisely determined and no coseismic surface ruptures were observed in the field. Using a pair of ERS data with small baseline and short temporal separation in the ascending orbit we obtained an interferogram that shows the coseismic surface displacement field despite poor coherence. The interferogram measures four fringes and displays an ellipse-shaped lobe with ∼11 cm peak line-of-sight displacement. The elastic modeling using a boundary element method (Poly3Dinv) indicate coseismic slip reaching up to 1 m at 5 km depth on the N 57° E trending, dipping 32° NW Tafna thrust fault. The geodetic estimate of seismic moment is 4.7 × 1017 N m. (Mw 5.7) in is good agreement with seismological results. The elliptical shape of the surface displacement field coincides with the NE–SW trending Berdani fault-related fold. The consistency between the geological observations and InSAR solution shed light on the precise earthquake location and related Tafna fault parameters.